It's the 25th of the month, which means that it is time to see what you have been up to that is New to You in 2013! Here are my New to Me in 2013 projects this month. This one is still a work in progress! Now it is your turn to share whatever you have tried for the first time in February. Add your link below, check out the other links for inspiration and leave a comment or two for encouragement. To spread the word please link back to this post in your blogpost and/or add the New to Me in 2013 Blog button to your sidebar or post. The link-up will remain open for 7 days to give us all plenty of time to be inspired. You did super well on your new things. I managed to get my circle quilting in this month, which I'm satisfied with, now to think of something for next month! 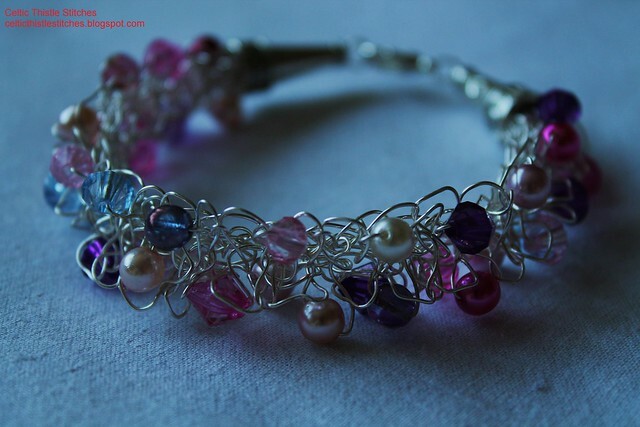 Love your knitting with wire! Beautiful! I've added a project I made right at the end of January, Fiona. Nothing new this month... must rectify that.. hmmm... I still need more hours in each day!!! You have had a busy month - excellent makes! You have had quite the busy month:) I really like your wire bracelet and the bag you made. Beautiful work as always! Your wire knitted bracelet is beautiful. I have seen the Made place in Whitley Bay and might dabble with one of her workshops this year as well as sampling the afternoon tea!